My best friend will appreciate this post the most. For years I've had some rather large works of art collecting dust that I did during our "silver age" of Greyhawk gaming. We were all in college and we had ALOT of time to play D&D. Countless hours were devoted to creating maps, floorplans and artwork for our home campaigns. After all this time I finally got the urge to dig out two of these Greyhawk masterpieces and take some half-way decent pictures of them. Both of these pieces were drawn on a full 22" x 30" sheet of stonehenge paper (texture kind of like vellum) and finished in colored pencil (Prismacolor). They're simply too big to scan properly. Many of you have only seen my goofy cartoons or semi-serious black and white drawings, but these are examples of what I can do given unlimited time and patience. Enjoy. First is a picture of the legendary Cruskii fighter Valkaun Dain. Here we see him sailing home from a quest on his longship down the river Skyr in Dainland. Valkaun is wearing his signature shadow dragon hide armor and carrying his runic sword of sharpness. This is just a cropping of the entire scene. Click here on the pic to see the detail and go here for the full illustration. Then there is the infamous "three towers". When Valkaun and his compatriot the archmage Mortellan finished clearing out all three parts of the Greyhawk Ruins, they used their vast wealth of gold and gems (and god knows how many Wall of Stone spells) to rebuild the above ground castle that once belonged to Zagig Yragerne. I think going by the 2e Castle Guide rules they cost the PCs a cool one million g.p. 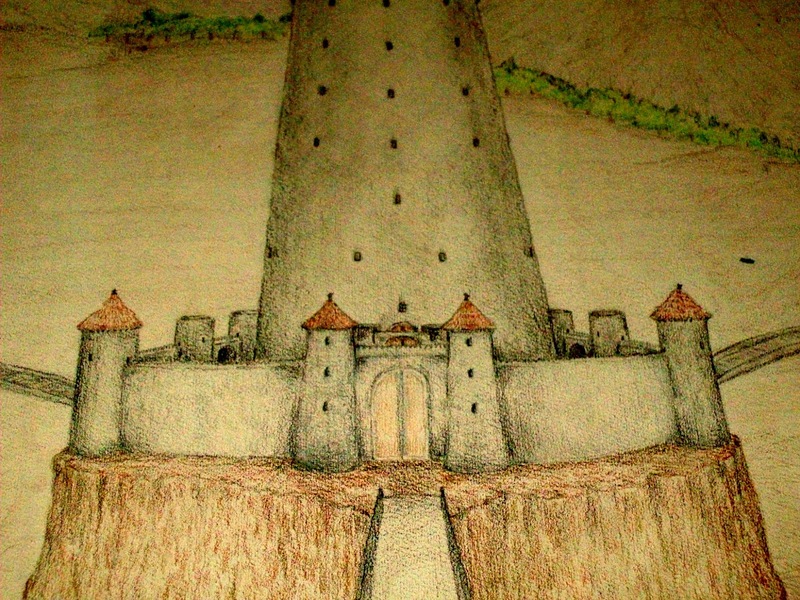 Due to the glaringly liberal scale used in the maps to Greyhawk Ruins, all three towers were 300 feet in diameter. I can't even begin to remember how high they were, but to keep proportion you can figure it out from the picture. What's more amazing is we drew all the floor plans to every level of these monstrous towers, no, skyscrapers. Why? Because we could! 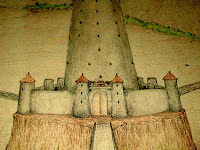 Click on the pic to see a close up of the central keep, then go here to see the new Greyhawk Castle in all its glory. The "full illustration" of Valkaun dain takes us to a cartoon. I was expecting an expanded version of the portrait to the left of the link. Thanks for the heads up SX, I often lose track with c/p links sometimes. Check it out now. The Three Towers looks like something out of one of Karen Wynn Fonstad's Atlases! I know you've got more. I'm thinking Dapper Dan might be able to scan those in completely. Those are awesome. I know a certain player is thinking about an Asgardian campaign right now! Hmm, I wish I could remember what those runes say. Do you still have those floorplans? Either he has the floor plans or I do... I'm pretty sure I do. We may not have all of them though. I'll have to check. The runes spell out F A L K A U N in futhark. There wasn't a symbol for V.
Over at the Greyhawk forum at The Piazza, Mortellan told me he has got the plans. I'd love to see them go on the blog sometime (with some notes about the work you guys did).